Moscow and Washington prove unable to agree on key issues. The talks in Brunei between Russian Foreign Minister Sergei Lavrov and U.S. Secretary of State John Kerry have clarified the key problems in U.S.-Russian relations. Moscow and Washington appear resigned to the failure of the initiative to hold an international conference on Syria — the so-called Geneva-2. In addition, Russian authorities have rejected President Obama’s recent proposal for drastic bilateral cuts in nuclear arsenals. The seventh meeting between Sergei Lavrov and John Kerry since February (when the latter became U.S. secretary of state) was largely devoted to Syria, as indeed were all the other meetings. Yet, while the two countries’ top diplomats had previously expressed optimism regarding the chances of a diplomatic solution to the Syrian conflict, the mood has now changed. The reason lies in problems that cropped up during preparations for the proposed international conference on Syria: The date and composition of Geneva-2 failed to be agreed upon. The scandal around former CIA agent Edward Snowden was expected to be the second topic of discussion between Lavrov and Kerry. It was the main topic for U.S. journalists: One of them spent the whole morning posing as a tourist, trying to waylay Lavrov at the entrance to the hotel and asking, without success, about the former CIA analyst. Later, at the very start of the talks, a Washington Postjournalist asked if Russia would grant political asylum to Edward Snowden. “Don’t shout at me,” the Russian minister shot back in English. 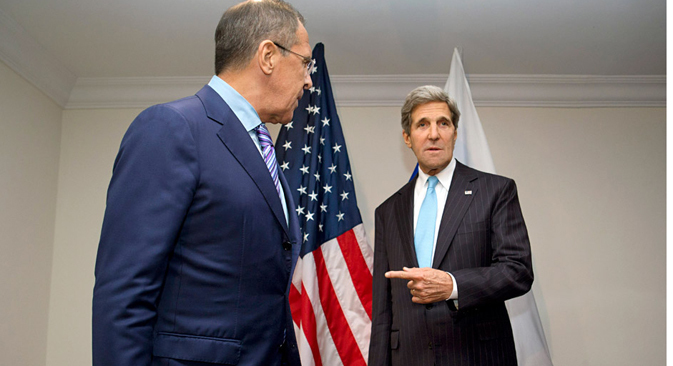 After the talks, Lavrov said that he had not discussed Snowden with Kerry. “Our president has said it all. They [the Americans] understand it,” the minister said. A recent addition to the list of differences concerns Barack Obama’s initiative to raise the level of trust between the U.S. and Russia by drastically cutting the two countries’ nuclear arsenals. Earlier, Deputy Foreign Minister Sergei Ryabkov said that Moscow would study Washington’s proposal. By the time of the Brunei meeting, however, Russia seemed to have made up its mind. A Russian diplomatic source told Kommersantthat President Obama’s initiative was largely a token in character. “In parallel, the U.S. is developing other types of weapons, refusing to ratify the Comprehensive Nuclear-Test-Ban Treaty and considering placing weapons in space,” the source said, by way of explanation. Thus, Moscow has effectively rejected Obama’s proposal.